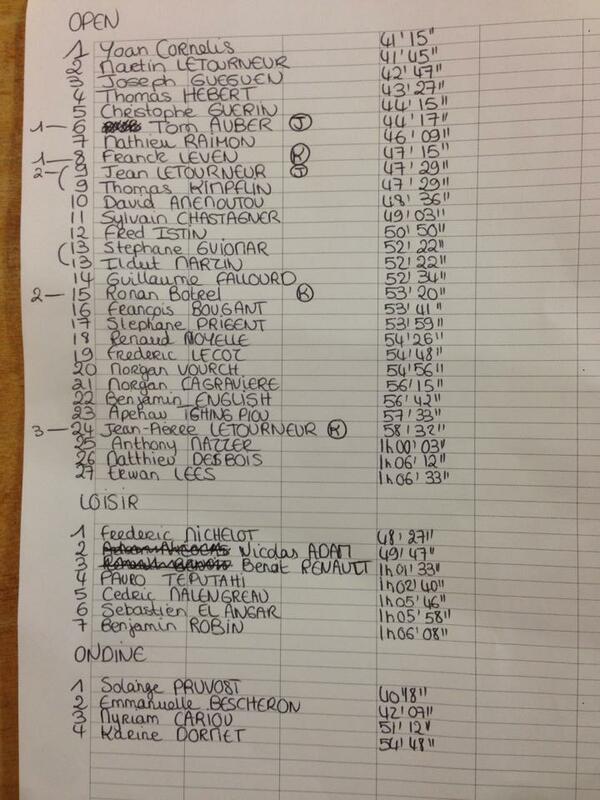 Pics and results from today’s race over in France. This was stop #2 of the latest Swell Beach Race Series, an excellent, long-running tour on France’s west coast that always attracts some very talented and very enthusiastic paddlers. Despite the freezing conditions (there’s a lot of neoprene in these photos), which wouldn’t have been helped by a stiff breeze, there were close to 50 paddlers out on the water in the picturesque village of Saint-Michel-en-Grève. With small but messy waves constantly rolling into the beach, the challenging BOP-style course race was won by Yoann Corenelis. A very talented OC-1 competitor who paddles standing up for the boutique Lokahi brand, Yoann has been around the French SUP scene for several years and it’s great to see him still in form. Today’s runner-up was Martin Letourneur, one of the young band of rising stars in Europe. Martin is a regular fixture on the Swell podium, though he got even more attention a couple of months ago when he won the Battle of the Paddle’s Most Courageous award for THAT wave. Rounding out the podium was Joseph Gueguen, a new name on the scene but a paddler who already has one big scalp – Jospeh (and Martin) finished ahead of Kai Lenny at the massive Paris Crossing race last month. Just 40 seconds adrift of Joseph was another relatively new (and young) face on the scene, Thomas Hebert. All of this highlights just how much depth France will have in the near future. For years they were led by captain Eric Terrien, but now the workhorse has plenty of company (and competition) from his compatriots. France has always been Europe’s strongest paddling nation and that doesn’t look like changing any time soon. In the women’s race today it was another Swell Beach Race Series stalwart, Solange Pruvost, who took the win, in just over 40 minutes, ahead of a small but determined field. One of the Swell Beach Race Series founders and podium regulars, Greg Closier, was fighting for the lead early but had to withdraw mid-race with injury. In what has been an emotionally horrid week for the French nation, it’s good to see a bunch of keen paddlers dusting themselves off, braving the elements and enjoying some fun racing. Below are the raw results plus some cool pics of the action thanks to Loic Olivier photography. Full gallery on the official Facebook page.